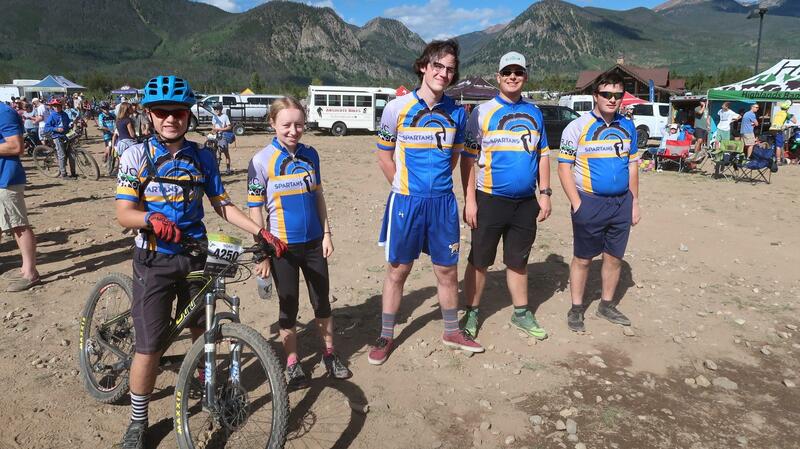 While most students were relaxing on their first day of fall break, STEM’s five mountain bikers were getting ready to head up to Eagle, Colorado, for the last conference race of the season. Cold temperatures and rain showers on Friday caused the league to cancel the pre-ride, but even so, every rider showed considerable excitement for the next day’s challenge. For Jack Debeer and Brian Sheahan, this race was the last in their high school careers – a bittersweet day for these riders who have worked so hard to get to this point! Saturday morning started out cold and overcast, with the JV boys racing first. Despite the near-freezing temperatures, and an early start, excitement was prevalent among everybody. Jack, Brian, and Ben all had great starts, pushing their way up a short but intense hill that quickly spread out the riders. After the initial climb, the course meanders through a fast, flowy single-track with plenty of twists and turns, featuring just enough obstacles to keep riders alert. Then the climbing starts, winding up the mountainside in tight turns while also including technical descent sections. The last section is the most exciting – a corkscrew descent with steep, fast switchbacks followed by a high-speed dash to the finish. Jack and Brian successfully finished their last high school race in places 122 and 126, with Ben Vigil, still a junior, finishing close behind. Both had lots of fun and were sad, but also satisfied, to complete their last race! 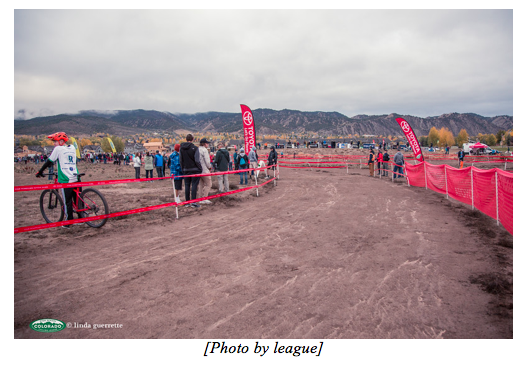 It’s worth mentioning that the JV boys did a great job of demonstrating sportsmanship values central to the Colorado League, Highlands Ranch Cycling, and the STEM team, both in Eagle and at every race. Even though they had just raced three laps, they stayed behind to cheer on the rest of their teammates as they raced throughout the day. Next on course were the JV girls, with Jillian Lukez excitedly anticipating the challenge to come. It was a fast-paced start up the hill and through the single-track, and luckily, the course stayed slick and packed down with optimal conditions. This race went by fast, and Jillian finished 15th. Even though it wasn’t her best finish, she still had a great time out on course! The sophomore boys raced later in the afternoon. 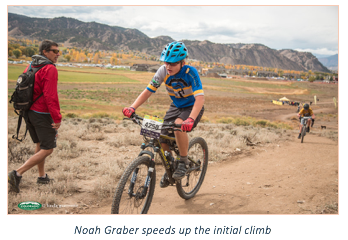 Despite the fact that he had never ridden the course before, Noah Graber went into staging with confidence, his focus and determination apparent in his strong start. His lap times were consistent, at 30 and 31 minutes, and he finished in a solid 88th place. The STEM team also accomplished another goal set before the race. In terms of team standings, the goal was to move up positions in Division 3, the category for smaller teams. This goal was accomplished, and STEM moved from 12th to 11th place in this race and the series overall! The conference championship race was a success for the STEM team as well as individual riders. 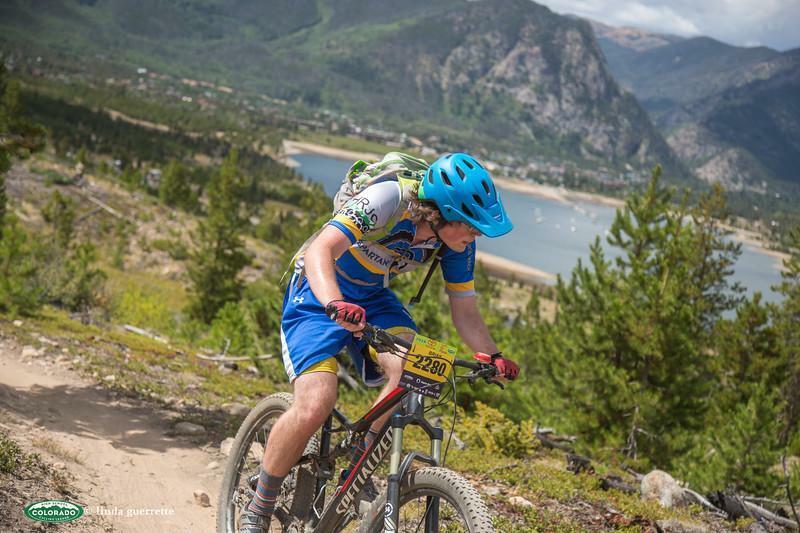 Jack and Brian, who successfully completed their last high school race, saw this race as an important benchmark in their careers as mountain bikers. Brian, who has raced all four years, can now look back and see how much he has improved and accomplished. 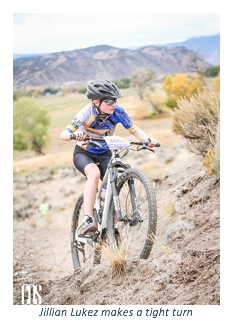 For Jillian, and possibly Noah (who is right on the edge of qualifying), next weekend is the state championships in Durango. With the last conference race over, and only a few practices left, it is hard to believe the season is coming to a close! Everyone on the STEM team showed dedication and determination, supporting their teammates and participating in every race, marking a successful first season. Great job Spartans! 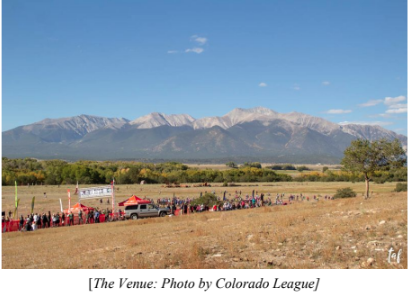 The third race of the Colorado League season was held this past weekend at McMurry Ranch in Nathrop, a small town tucked between Buena Vista and Salida. The weather couldn’t have been more perfect, with sunny skies and warm temperatures offering gorgeous views of the Collegiate Peaks. Once again, all five STEM racers participated! The venue consisted of a double track climb just after the start, immediately followed by a single-track climb to the top of a plateau with flowy single-track and quick turns through a pinyon-juniper forest. A quick, technical descent winds its way down to Chalk Creek, where riders navigate through aspens and cottonwoods accentuated by the fall colors. Finally, a mix of fast single and double track leads to the finish - but not before a large water and mud puddle marks a chance to cool off! At the top, an extra challenge is presented for riders. Cacti line the edges of the trail, making passing a challenge, and sandy corners require skilled positioning on the bike. This time, the JV girls were the first to race at 8:30. The temperature was warming fast, and everyone was excited to race. Jillian Lukez, starting in 12th, had a great time riding the course and finished 10th, accomplishing a personal goal! She finished with a negative split, meaning her 2nd lap, at 32:17, was faster than her first, at 32:35. In the afternoon, it was time for the sophomore boys to race. 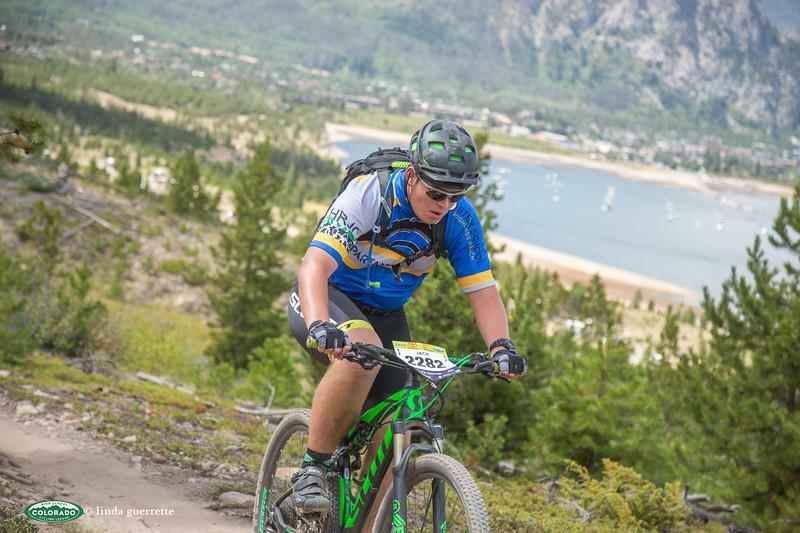 This weekend was Noah Graber’s first time riding the course, but nonetheless he finished in 93rd place out of 132 riders, racing with confidence and finishing without any crashes or mechanicals. Great job Noah! Last but not least, the JV boys set off on the course after anticipating their race all day. Brian Sheahan and Jack Debeer finished only four places apart, successfully racing all three laps. Ben Vigil, for whom this was also his first race on the course, also had a great race. Participating in a three lap race in one of the most competitive categories is a feat in itself, and this time, these racers faced an additional challenge - Competing during the hottest time of the day! Once again, STEM racers did a great job on Sunday, leaving it all out on the course in a fast, challenging race. Cheer on STEM when they race in Eagle in two weeks! 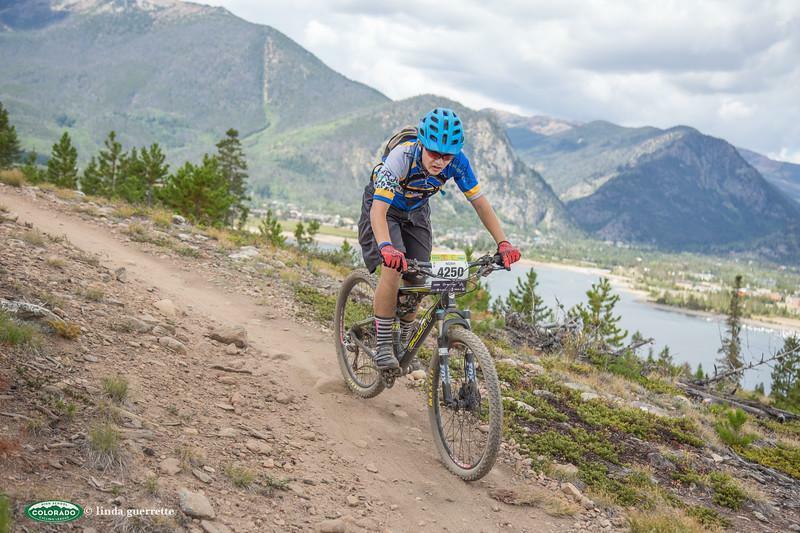 The second race in the Colorado High School Cycling League posed a unique challenge - An altitude of 10,152 feet, nearly two miles high. 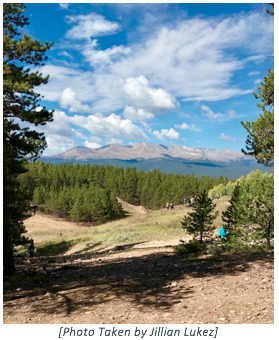 Hence named the Cloud City Challenge, STEM’s five racers left it all out on the course in a remarkable display of grit and perseverance in Leadville on September 9th. 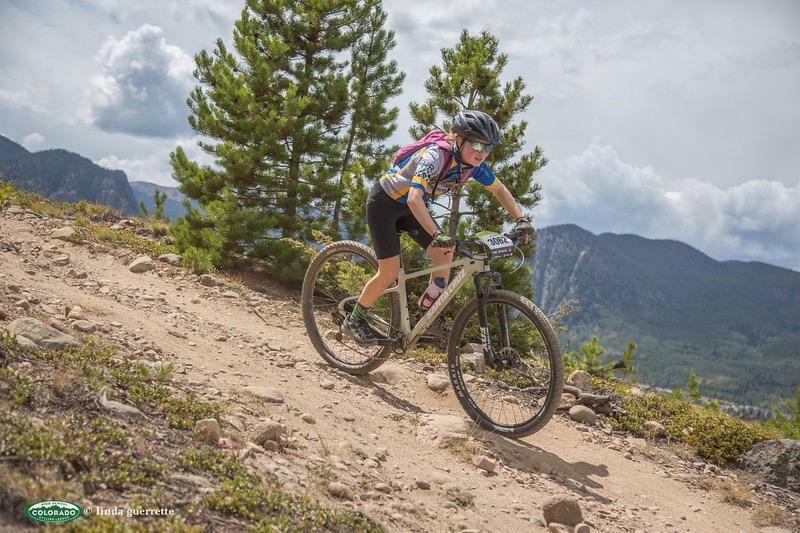 The course started at the Colorado Mountain College, consisting of a variety of flowy single-track, dirt road climbs, and harrowing descents through tight trees. 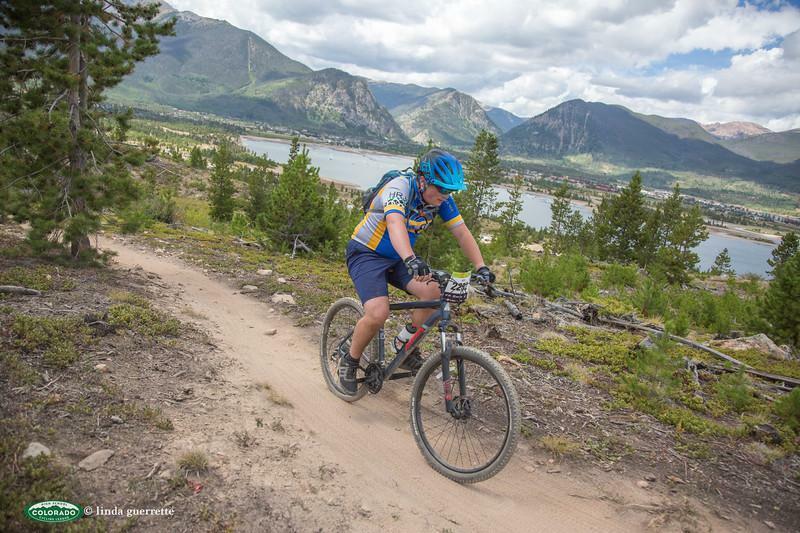 The challenge of remaining focused on riding is only increased by the gorgeous scenery, including valleys of gold aspen trees and jaw-dropping views of Mt. Elbert that define this course as both strenuous and beautiful. The race starts out with a long climb on a dusty dirt road, testing the endurance of athletes from the start. The fun part, however, starts on the single track that winds through aspen trees with just enough switchbacks, rocks, and views to keep it interesting. After a long descent with plenty of opportunities for gaining speed and making passes, a quick, steep climb awaits riders at the finish - or the start of the next lap. The sophomores were the third group to start, but the first group with a rider from STEM. Noah Graber, nervously but excitedly anticipating the start, had the advantage of a good starting place near the front of the second wave of riders. Maintaining a steady position throughout the race, he finished in an impressive one hour and sixteen minutes, coming in 79th place out of 140 riders. All of STEM’s riders raced back to back, with the JV men demonstrating incredible perseverance and character. The normal chaos of the start was only amplified, with a sudden rainstorm from a passing cloud. Mountain weather at 10,000 feet is unpredictable at best, and just five minutes later, the sun and blue skies were out again. From STEM, Jack DeBeer, Brian Sheahan, and Ben Vigil sped through the start, their excitement throughout the day showing through in a tough, no less than, 18 mile race. Finishing close together at 149th, 150th, and 159th place, these racers held their own in the largest category of the day. Last to race were the JV, sophomore, and freshman women, with Jillian Lukez, the STEM team captain, in a great start position at 13th in JV. This is her favorite course, and she finished in 12th place with a time of one hour and thirteen minutes. Perhaps the most impressive feat throughout the day was the sportsmanship and support for their teammates and other riders showed by STEM athletes, not to mention the grit and determination demonstrated while racing. The race was a success, and it’s now time for riders to start preparing for the next race in Nathrop! 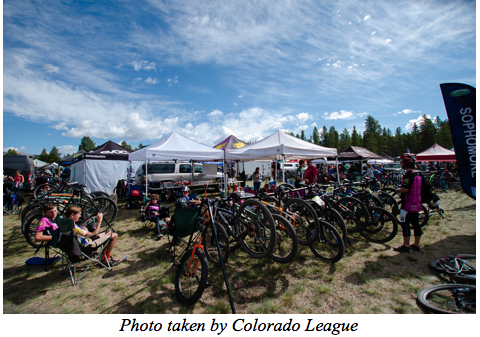 This year’s high school mountain bike racing season with the Colorado League started off strong at the Frisco Bay Invitational, on Sunday, August 26th, 2018. 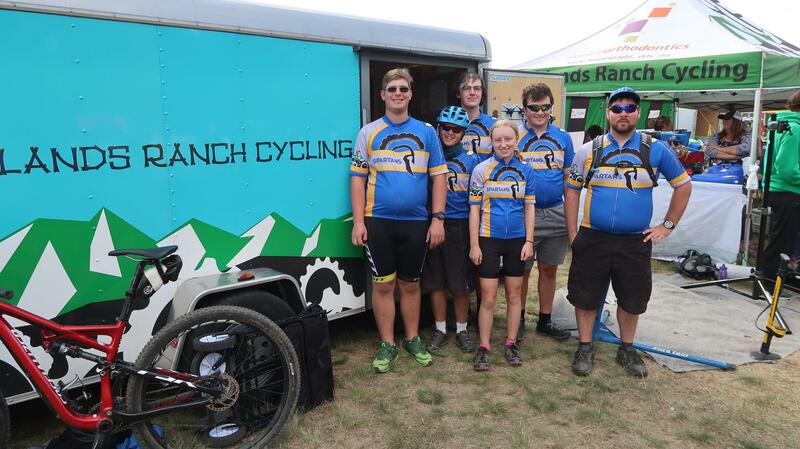 Varying temperatures and a dusty, rocky course made for plenty of excitement throughout the day, with nearly 50 riders in the Highlands Ranch Cycling composite team, including five from STEM! Jack Debeer and Brian Sheahan, both seniors, were the first STEM racers to take off, along with Ben Vigil, a junior and a first-time racer. 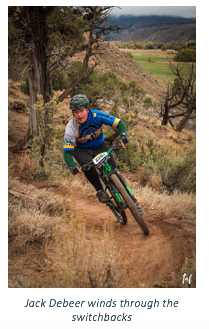 Brian raced as a Legacy rider (Meaning he’s raced all four years with the league), and all three are part of the Junior Varsity Division. This is an extremely high level of racing that requires endurance, grit, and perseverance. It is also one of the largest categories, with two waves of racers. The JV men race three laps, a total of 18 miles. All three had successful races, Brian finishing in 141st place with Jack only three places behind him, and Ben nine places behind Jack. Despite the difficult challenge of racing in one of the most competitive divisions, it was clear that STEM’s three JV men were proud of their results. After the JV division came the sophomore men, who race two laps. This was Noah Graber, a sophomore’s, first race. Riding into the staging area and experiencing the thrill and chaos of a race start for the first time can easily be overwhelming, but Noah remained focused and had lots of fun despite the pressure. Out of 132 participants, Noah finished 91st within an hour and 16 minutes - A remarkable feat in a once again competitive group, and a successful first race! As the day went by, the JV, sophomore, and freshman women had yet to compete. Although there are far less female riders than male, the sport is increasing in popularity to everyone. Jillian Lukez, STEM’s only female rider, competed as a junior in the JV division. This is her third season racing with the team, and she is just as excited as ever to be a part of the league, especially as a JV racer. She raced two successful laps with a time of one hour and 11 minutes, finishing 13th out of 55 JV women! 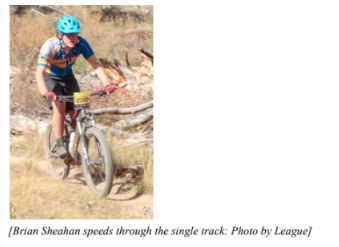 The first race of the season was a huge success for Highlands Ranch Cycling, particularly the new STEM team. Goals were met, celebrated, and reflected upon, the results showing the grit and determination possessed by these five racers in a difficult and demanding, yet rewarding and supportive sport.